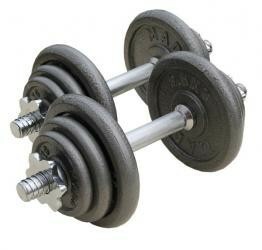 20KG Hammertone Dumbbell Set Includes:- a pair of 14" x 1" Bars 4 x 0.5kg, 4 x 1.25kg, 4 x 2.5kg discs. 2 x 35.5cm spinlock bars. 4 spinlock collars. 7 weight combinations. Total weight including handles, 17kg of plates and collars is 20kgs.